Last Sunday we heard how the religious leaders demanded to know from Jesus where his authority came from. Here’s what I said. Ask any parent and they’ll tell you – being a parent is one of the most difficult things you’ll ever do in your life. And it doesn’t stop when the children leave home. And all the while you have at the back of your mind that you must always treat them carefully because they’ll be choosing the care home you go to when you’re old. My favourite quotation about parenting and children is from Erma Bomberg, an American humourist who wrote a newspaper column about family life in the latter half of the last century. She wrote: When my children become wild and unruly, I use a nice safe playpen. When they’re finished, I climb out! Before anyone has children they naively assume that raising well-behaved and well-adjusted children is easy. You just need a bit of authority. The times over the years I’ve heard people who haven’t had children make comments about the way parents should be looking after and controlling their children better. They obviously have never heard the words of the poet Ogden Nash: Children aren’t happy without something to ignore, and that’s what parents were created for. 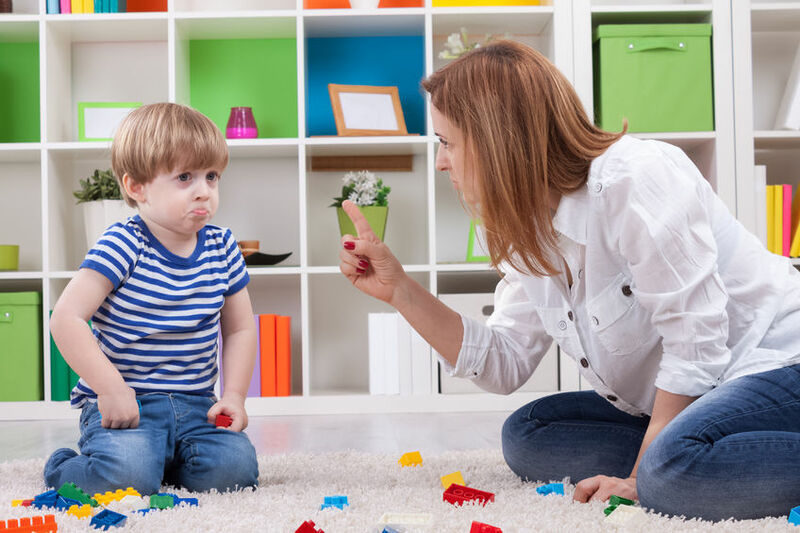 Every parent knows you do your best to exercise some authority – it just so often fails to have much effect. One of our daughters, when she was young, apparently had no fear of danger, and holidays were often a nightmare spent trying to keep her out of trouble. If there was a wall it was there to climbed on and walked on. If there was a cliff she was the one who would walk right up to the edge to look over. We seemed to spend so much of our time saying “Get down from there”, “Come away from there”. “Why” was the inevitable answer. “Yes it is” would come the reply. Try as we might, exercising our authority in such situations was hard work. Even if, eventually she did as she was told, as soon as our backs were turned she’d be off doing something else that was dangerous. On one occasion, when we were on holiday on a farm in Wales, she was fascinated by the two Welsh ponies that the farmer kept in a field next to the converted barns in which we stayed. We had tried our best to get across the message that she was to stay out of the field. It was like a red rag to a bull – convinced that two Welsh ponies were perfectly safe and friendly one day she decided to climb over the fence and ride one of the ponies. The pony had different ideas and bit her quite severely. She has never forgotten the experience. It made no difference though – she still refused to take any notice of us when she did something we thought was dangerous. Today, the age of unquestioning obedience to authority is long over and each person, for good or ill, tends to consider themselves to be their own best judge and wisest guide. But this was not the situation in Jesus’ day, when the word of the religious leaders in all matters of life and religious observance was law. They were unused to having their authority usurped and their teaching questioned, and the presence in their midst of Jesus, an itinerant preacher from Galilee, was profoundly disturbing. Neither was this the first occasion. We are now – in Matthew’s Gospel – in Holy Week. The previous day, records Matthew, Jesus had arrived in Jerusalem riding on a donkey, hailed by the crowds with palm branches and cries acclaiming him as “Son of David”, and “the one who comes in the name of the Lord”. On entering the Temple he had driven out all those buying and selling there, accusing them of turning his Father’s house of prayer into a den of robbers. He followed this by audaciously curing all the blind and lame that came to the Temple to see him. The religious leaders are clear – you simply can’t have people behaving like that and challenging their authority. They know what’s best for people. And so they confront Jesus. Desperate to restore their own authority and undermine him in the eyes of the crowd, they demand to know by what authority Jesus acts and speaks in the way he does, and who has given him that authority. Jesus answers this challenge indirectly, but in a manner that exposes the religious leaders for the hypocrites that they are. Because of the religious leaders’ unwillingness to answer Jesus’ question about the authority of John the Baptist – whose teaching they have wilfully rejected – Jesus also refuses to answer their question. And he tells the parable we heard in our gospel reading about two sons – which will ring bells for those of you with children, as it must have done for those who heard it then. Let’s bring it up to date a bit. A man with two children asks the first to go and tidy their bedroom. They say “No” but later change their mind and go and does the tidying up. The man asks the second child the same thing – this child says of course they will go and tidy their bedroom – but then they don’t and just go off and play instead. Which of them, asks Jesus, does the will of their father? The one who says they will tidy up but doesn’t, or the one who initially says they won’t tidy up, but does. Jesus uses the parable of the two sons to make clear to everyone that those who may appear to be furthest from God – the prostitutes, the tax-collectors and other outcasts – are actually the ones who most know their need of him. And that they are closer to God than many of those who are supposed to be his chief representatives on earth. Those who have apparently not been keeping the rules, but change their minds and follow God, are those who are doing the Father’s will. Those who claim to keep the rules, the religious leaders, yet hypocritically find ways to look after themselves and reject what is at the heart of God’s Law, are not doing the Father’s will. For the pillars of the religious establishment this was at best dangerous sedition, at worst, possibly blasphemy. By the end of this chapter in Matthew, the religious leaders are beginning to look for a way to arrest Jesus and silence him. It is quite a salutary exercise to ask ourselves where we feel our sympathy lies in this incident. Is it with the religious leaders, deeply troubled by the challenge to their ordered religion Jesus appears to bring? So often we do not like those who challenge the status quo, whether it’s those who say we need to modernise the way we worship, or who want to introduce women bishops, or who say we need to engage more with those who don’t come to church instead of only those who do! Or perhaps we identify with the outcasts, reaching out in wonderment to one who offers us hope and acceptance for perhaps the first time in our lives? Imagine how the religious leaders must have felt, having their authority challenged in this way and being told that they really didn’t have a clue! Imagine how those who had been condemned and cast out by those same religious leaders must have felt to hear Jesus say they were closer to God and that God wanted them. “By what authority…?” We too may ask this question of those who challenge us to move out of our comfort-zone so that we can allow our relationship with God to grow and deepen and be more open to those in spiritual and physical. We may have it asked of us, when our faith in Christ leads us to challenge the comfort-zone of others. Our daughter, when she was climbing on walls or walking along the edge of cliffs, had to decide whether she was prepared to trust our authority when we tried to get her to move to a safer place. She needed to learn that we were not trying to spoil her fun but that we really did have her best interests at heart. Perhaps sometimes it is like that with us and Jesus. Do we trust his authority in our lives? Are we prepared to submit to it? Even when it seems to contradict the established order of things? Are we willing to do what the religious leaders in our gospel reading could not do? Place complete trust in Jesus, to accept his authority in every aspect of our existence, knowing that his motive in exercising authority is pure love and our highest happiness.